NASA rolls out the first Space Shuttle, Enterprise, from its assembly facility to a waiting crowd. Included in the crowd was a delegation of actors from the Star Trek TV series. 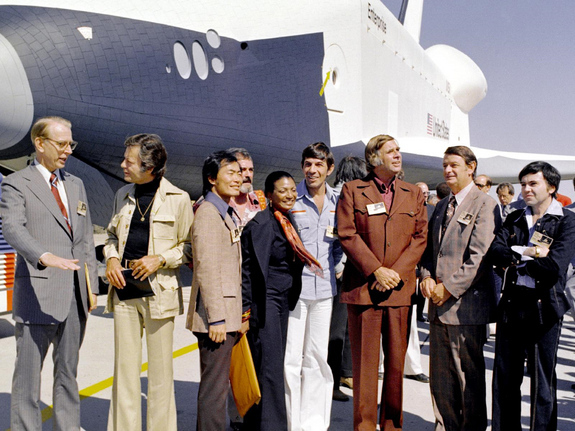 Originally to be named Constitution, a write-in campaign by Star Trek fans convinced President Gerald Ford and NASA to rename the Space Shuttle. The Enterprise was a prototype shuttle, designed for the early testing phase of the Space Shuttle program. It was built without engines or a functional heat shield. While it performed various atmospheric test flights, and was originally intended to be retrofitted for spaceflight, it was determined that it would be less expensive to simply build new shuttles. Therefore the Enterprise never did actually fly into space.